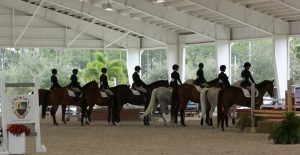 Riders in grades 8 – 12 entered to participate in the CPI Horse Show. In order to award the scholarship, there must be a minimum of ten (10) online test entries in the contest. All participants must pre register to participate in the CPI Practical Horsemanship Challenge using the link below. Entries are limited and on a 1st come, 1st serve basis. $250 to the rider with the highest test score. In the event of a tie, the award will be split evenly among the winners. The award will be paid to a college, university, trade school or vocational school. Upon enrollment to any of these post-secondary educational schools, a written request from the award winner must be made for payment to the designated school. Rider is to show up to the designated CPI Practical Horsemanship Challenge area at their designed time. Rider must be present at the clinic for the entire designated time. Click on the link below and submit your registration for the 2019 CPI Florida Practical Horsemanship Challenge. If for any reason the Contest is not capable of running as planned, due to infection by computer virus, bugs, worms, trojan horses, denial of service attacks, tampering, unauthorized intervention, fraud, technical failures, or any other causes beyond the control of the CPI that corrupt or affect the administration, security, fairness, integrity, or proper conduct of this Contest, the CPI reserves the right, at its sole discretion, to disqualify any individual(s) who tamper with the entry process, and/or to cancel, terminate, modify, or suspend the Contest. If the CPI elects to cancel or terminate the Contest, the CPI will not retain any rights in the submitted tests.